Every member associated with Hockey in Newark, past and present, has a dream. "In 10 years, we'd like to see somebody drafted into the NHL out of Newark. And we feel very strongly about that," New Jersey Devils owner/chairman Jeff Vanderbeek told NHL.com. Hockey in Newark may not be in the business of grooming NHL talent. But the group has instilled in local inner-city children and teenagers a hope and desire that may not have existed a decade ago. As a result, participation in ice hockey among teens in the city continues to grow. "Hockey equipment is expensive and ice costs can be astronomical, but HIN does more than teach children how to play hockey. It makes sure that the students are doing well academically," HIN graduate and current Princeton University freshman Kevin Lopez told NHL.com. "HIN played an important role in my getting into Princeton. My mother would tell me that if I dropped below a 4.0 grade-point average, I would have to leave the program. So I made sure that I was on top of everything because I wanted to play hockey so bad." Lopez never did dip below that GPA, and he was valedictorian of the 2012 class at Technology High School in Newark. Having grown from five to over 200 participants since its inception in 2003, HIN was introduced by Newark East Side High School teachers/coaches Keith Veltre and Dennis Ruppe. They not only helped save the school's ice hockey program from disbanding, but in 2007 they planted the seed for an even greater future by conducting a clinic that aroused the interest of over 50 children, ages 10-14. "Through HIN, we're reaching so many more kids," Veltre told NHL.com. "When I can take young kids, get them into a rink five or six days a week and keep them from getting into negative situations, you're not only building a hockey program but a family. "This is a family. It's about hockey, but there's so much more than that." The Devils have also partnered with HIN, providing economic support and equipment donation drives while working with the city to refurbish the local Ironbound Rink. Thanks to those efforts, the program's first all-Newark recreation league, which includes four teams made up of 70 children ages 11-14, was created this year. The players practice twice a week and play every Saturday at Ironbound. A championship is scheduled to be played at Prudential Center in March. "When we started to look at possible locations for our new building [Prudential Center] eight or nine years ago, we knew we wanted to grow and support hockey through the community and in Newark," Vanderbeek said. "We started that with Keith and Dennis, and we've supported them ever since. They've done a fabulous job." Thanks to their work with the Devils and the NHL, HIN also provides unique opportunities for participants to meet professional players past and present. 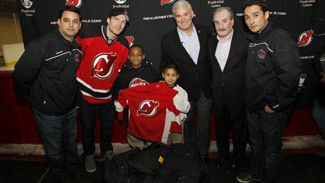 New Jersey's leading scorer, David Clarkson, recently paid a visit to Ironbound to help donate 50 sets of equipment. Additionally, Willie O'Ree, the man who broke the NHL color barrier, has also spent time with the kids. "When I walked into the room and heard those kids cheer, it was a great feeling," Clarkson told NHL.com. "It was special for me to be there with them. I always believe in giving back and I told Keith [Vetre] that I'd like to come out once every couple of weeks and go on the ice or do something with them because they really touch your heart." As someone who has witnessed HIN's work firsthand, Clarkson expects to see more success stories coming from Newark in the future. "I told all those kids [during the donation drive] that when you dream, dream big, because everyone told me I wasn't big enough, wasn't good enough and that pushed me," Clarkson said. "So, no matter what situation you're in or where you're from, I think if you believe in yourself and dream, anything can happen." One of the program's most prominent graduates, Lopez is currently in his second semester at Princeton. He said he might major in Urban Policy in the Woodrow Wilson School of Policy and International Affairs next year. For now, he's involved with the Princeton Club hockey team and Princeton Latino group while serving as a mentor to a child at City Invincible Charter School in Camden, N.J. But when he first joined HIN as a sixth grader, he couldn't skate and was unfamiliar with the rules. "He was cut from the soccer traveling teams, so he decided to give hockey a try. He had an unbelievable desire and told us back then that he wanted to go to Princeton," Veltre said. "I remember being on the ice and getting that phone call from him. All I heard on the other end were Spanish people screaming and crying. Kevin said, 'Coach, I got into Princeton.' It sent chills up and down my spine."